High yield topics list in descending order of priority in respective Subjects for AIPGMEE, AIIMS, PGIMER, JIPMER, DNB CET and Other State PG Medical entrance exams. 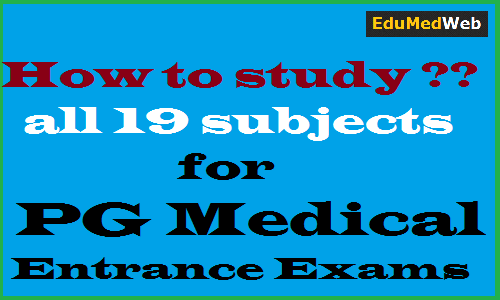 It Is Always Confusing For Students Preparing For Post Graduate (PG) Medical Entrance Exams Like AIIMS PG, NEET PG, JIPMER, PGIMER about Which Books To Use. As These PG Medical Entrance Exams Are Based On Multiple Choice Questions (MCQs), Classical Medical Textbooks are Not of Too Much Use. As MCQ Books are Needed for orientation to exam pattern and also for quick revisions, Here I Am Mentioning Commonly Used MCQ books by medical students to crack these entrance exams.